Supported Formats for the Subnets are: 1.1.1.1/255.255.255.255 or 1.1.1.1/32 (CIDR-Notation) and (InetAddress,Mask) where Mask is a integer for CIDR-notation or a String for Standard Mask notation. Compares the given InetAddress against the Subnet and returns true if the ip is in the subnet-ip-range and false if not. 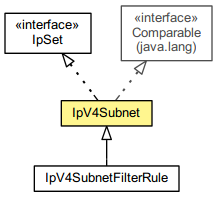 Compares the given IP-Address against the Subnet and returns true if the ip is in the subnet-ip-range and false if not. netAddress - a network address as string.